Want a high impact color and bedazzling super-shiny finish? Nykaa Gold Rush Nail Lacquer Collection brings you superior nail lacquers with light reflecting pigments that deliver intense, long-lasting color. Perfect for times when you DO want super shiny nails that last longer than regular polishes. The Gold Rush collection is for the glamorous, uptown girl! This exquisite collection makes you want to reach out to glass of merlot. It's like having 24K gold on your tips; your pinkies never looked more chic! There is gold in the air and love in your heart! Treat yourself with this beautiful olive gold shade and let your day shine like solid gold. Say yes to all the finer things in life with Nykaa Gold Rush Nail Lacquer in Flicker Gold. 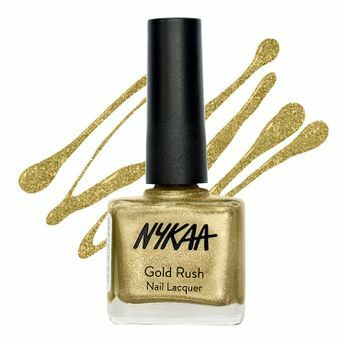 The Nykaa Gold Rush Nail Lacquer Collection is FIVE FREE. The nail polish formulas are not only made without the three most common chemicals found in nail polishes (Toluene, DBP and Formaldehyde), but also without two other very dangerous chemicals (Formaldehyde Resin and Camphor). The Nykaa Gold Rush Nail Lacquer Collection is NOT tested on animals and contains no animal-derived ingredients.